When I was growing up, my family would go backpacking for summer vacation. A week’s worth of food and gear on our backs, we would hike into one of Oregon’s many backcountry lakes to camp and fish and swim. When I was 20, I lived in Spain as part of a study-abroad program. I spent my non-school hours roaming around the small streets of the city, reveling in a culture that was so fascinatingly new to me. Combine that background with the fact that I’m fiercely independent and you would think that I had been hard-wired for bike touring. The truth, however, is that it took some creative convincing on Russ’ part to get me on board. At the first mention, I promptly shot down Russ’ great idea. Who wants to put a lot of weight on a bicycle and work so hard to move so slowly, to be dirty for long stretches of time, to limit the pairs of shoes you can wear? Sure, I was commuting to work by bike and grocery shopping by bike, but this whole travel by bike thing sounded exhausting and difficult – and not really the direction I thought I wanted my life to take. And a few weeks later, we went. And it was sort of a comedy of errors. Just about everything that could go wrong and convince me that bike touring was terrible, happened. It was the coldest weekend on record in central California. Restaurants were closed because their pipes had frozen and burst. The train was hours late, so we arrived after dark, exhausted and cold. Neither of us knew how to pack, so I had a basket on my handlebars, with a hairdryer in it. But we did go wine tasting. 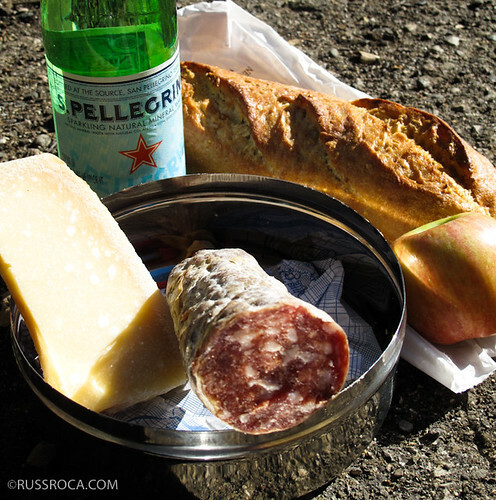 And we did eat picnics of bread and cheese. And when the sun came out and it was just us on country roads, talking to cows and sheep, it was glorious. Somehow, in spite of myself, I fell in love. We’ve met so many people who love the idea of bike touring and really want to travel on their bike – and lament that their partner isn’t as interested as they are. I may be a hard-core bike traveler now, but I still completely understand that hesitation and anxiety of being the partner who doesn’t want to go. And I believe it all comes down to how you sell it. When Russ first pitched the idea, my head swam with ideas of not showering and being covered in mosquitoes and eating gross freeze-dried foods. In essence, I thought of the very worst things that could possibly happen. As soon as he reframed the idea, and met me where I was, it turned into something that wasn’t as terrifying. When you say ‘bike touring,’ most people immediately think of spending months crossing the country, in less-than-romantic conditions. It’s like a moving bachelor pad – unkempt, haphazard, full of peanut butter and jelly sandwiches. But, in my experience, bike touring can be so much more than this stereotypical image. Don’t want to camp? Stay in a motel or a B&B. Don’t want to cook? Go places where there are restaurants and eat out. Don’t want to go for weeks on end? Start small and just go for a night or two. If you’re hoping to convince your partner to go with you, ease into it. Call it bike travel or a bike vacation. Liken it to another great experience you’ve already had, or something you’ve always wanted to do together. Plan a themed trip around a common interest – wine tasting, food, architecture, bird-watching. Romanticize it somehow – no kids, no pets, no kitchen to clean, no yard to mow. Promise to ride slower, carry more of the gear, cook an elaborate meal. Offer to take care of all of the details, so that your partner just has to choose his/her clothes and show up. 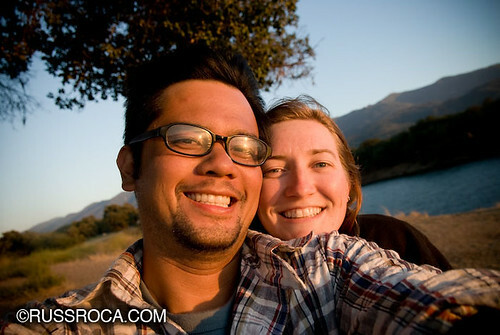 One of the things that I’ve learned about bike touring is that it’s an amazing thing to do with your partner. You experience incredible moments together, you spend hours talking and connecting as you ride down the road. But just like being in a relationship, it has to be something you do together, and you have to meet each other in a comfortable space. Maybe that means that bike touring together looks completely different than bike touring by yourself. Maybe it means that your tour with your partner looks completely different from my tour with my partner. And maybe that’s the point. Bike touring with your partner is a collaboration, a way of experiencing your lives together in a new way. The only thing it ‘should’ be is whatever works best for you and your partner, whatever makes you both enjoy the experience and want to do it again. So rethink your pitch. What does your partner worry about when you’ve suggested the idea before? How can you alleviate the nervousness and create a deeply-memorable and enjoyable trip? Try again, do it differently and, if you need to, tell your partner that I wasn’t convinced at first either. Can my pitch just involve sending my partner this link? I must be a smooth talker, because less than one month into knowing me, my girlfriend pretty much invited herself on my planned bike tour. It worked out for the best, though– she’s much more meticulous about the money issue than I am! I was pretty much just like, “Yay bike tour! I want to go anywhere!” Almost a year since she invited herself, and we’re planning on launching this September– couldn’t be happier. 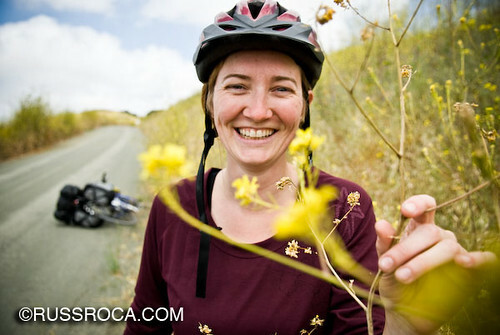 I was lucky that my wife and I arrived at the decision mutually to give bike touring a try. We have done many weekend and 3 or 4 day trips, several week long tours and this past October a 2 week trip on the C&O Canal Path and great Allegheny Passage. Our goal is to take off cross country when I retire in 3 to 4 years but until then we plan to do many short term tours. We would love for you guys to come through St. Louis on your next tour. We have many exciting things happening here in relation to cycling, bikeable/walkable legislation, new bicycle commuting center, etc. I’d gone on exactly one overnight trip (to a cabin!) at that point, with a bunch of friends that didn’t include Shawn. And as we rode by a historical marker, a friend said, “Yeah, if Shawn was here, he’d want to stop and read it, even if he’d already seen it,” and I remember thinking, I am traveling with the wrong people, ’cause that’s what I’d do given a choice! So while Shawn didn’t have to talk me into trying it, he did end up playing cheerleader on a number of occasions, because I had a heavy and badly-geared bicycle to start with. Also, I’m terrible with logistics and directions, and that’s what Shawn excels in, so Shawn always does that part. Which is fine by me! We did a bunch of touring last year, and I can’t wait to try longer trips this year. Our longest trip last year, of nine days, was so awesome. I’m not sure how we came up with the idea to bike tour… I think it may have been his idea, but he sold it to me in a way that made it seem like it was my idea too. We put over 10,000 km on our bikes after two summers of touring. We started in Canada and the US the first summer to get the hang of it. The second summer we cycled around Europe. It was a lot of fun and definately a unique trip. We got lost quite often and have many helpful people to thank for helping us along the way. Now try convincing a spouse AND two kids … it is possible and the end result is a lot of fun. Having never toured myself, I’ve been thinking I’d LOVE to tour France. Knowing that wouldn’t work, I floated the idea to my wife of touring parts of Ireland. Critical to the story is to know that she’s an adopted daughter, and only recently learned that she’s got Irish ancestry! This summer, we’re starting small, doing a 5 day credit card tour in Michigan (Gaylord to Mackinaw along with our 3 kids) to see how we like it. So far, all she’s ruled out is camping. If all goes according to plan, we’ll be in Ireland next summer! Now you need an article on how to find and keep a partner. My girl won’t bike more than a few miles, but she has offered to do SAG for me. Given a few more years, a recumbent for her and some vacation it may yet happen…but until then all I can do is recount my mini-tour adventures and hope that it sinks in. Heh, after reading this I keep hearing my wife say to start small. It is the idea that my son wants to cross Canada with his old man on recumbent trikes. Maybe I will read this a few times and get her to try a weekend away with cc etc… And maybe when we retire ….the whole enchilada. What a great story! If I were in better shape (okay, that’s making me think about my new year’s resolutions…) I would suggest this to my husband – he’s the one who would likely be reluctant. I’m sure we could easily find a good seat for our toddler daughter and do a day or two of biking. 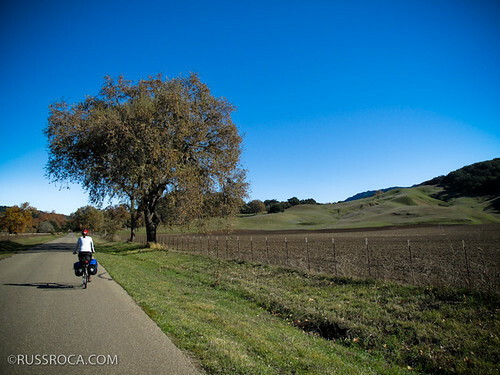 We drove around Santa Barbara wine country for our fifth anniversary and I’d love to go back on bikes! Can your partner call my partner? My husband has no interest in doing this, saying it’s ‘dangerous’ to bike on the roads. I am longing for an adventure like this. I’m going to have to take your advice into account and start over on my getting-him-to-come-with-me endeavors:) Thanks for the inspiration! YES! It’s amazing what a little PR will do. Thank you for tackling the topic. do you help me for this idea?